In 1865 Boston, the literary geniuses of the Dante Club—poets and Harvard professors Henry Wadsworth Longfellow, Dr. Oliver Wendell Holmes, and James Russell Lowell, along with publisher J. T. Fields—are finishing America’s first translation of The Divine Comedy and preparing to unveil Dante’s remarkable visions to the New World. The powerful Boston Brahmins at Harvard College are fighting to keep Dante in obscurity, believing that the infiltration of foreign superstitions into American minds will prove as corrupting as the immigrants arriving at Boston Harbor. 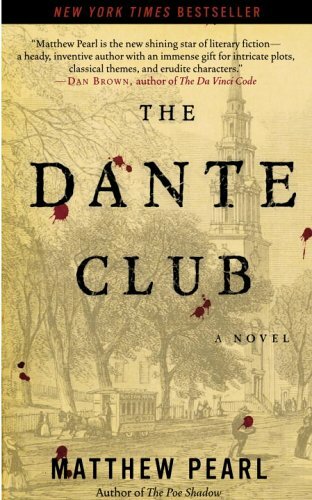 The members of the Dante Club fight to keep a sacred literary cause alive, but their plans fall apart when a series of murders erupts through Boston and Cambridge. Only this small group of scholars realizes that the gruesome killings are modeled on the descriptions of Hell’s punishments from Dante’s Inferno. With the lives of the Boston elite and Dante’s literary future in America at stake, the Dante Club members must find the killer before the authorities discover their secret. I am not usually a big thriller reader, but the title of this one sparked my interest because I love Dante's writings. The opening was a little slow, but by the time I was a quarter through, I was hooked. The idea of murders based on Dante's Inferno works well and offers many opportunities for both grisly scenes and secret codes that will eventually lead to the killer. I loved how many of the characters were real-life figures, lending an air of believability to a story that might otherwise have seemed a little far-fetched. The men of the Dante Club are all uniquely presented and well-rounded characters and the plot flows seamlessly. For me, the best aspect of this novel was that I never anticipated who the killer was ahead of the reveal. Several times I thought I had the answer only to be proven wrong a few chapters later. The red herrings worked really well in hiding the truth and the killer's identity came as a complete surprise to me. Once that big moment was over, I did find the tail end of the book a bit more predictable; but by then I was fully invested in the story and characters and so it didn't matter. One for fans of well-plotted thrillers or those who like a literary mystery. Sounds interesting. I haven't read many mysteries lately but I used to read more. Looks good.